Hurry up! 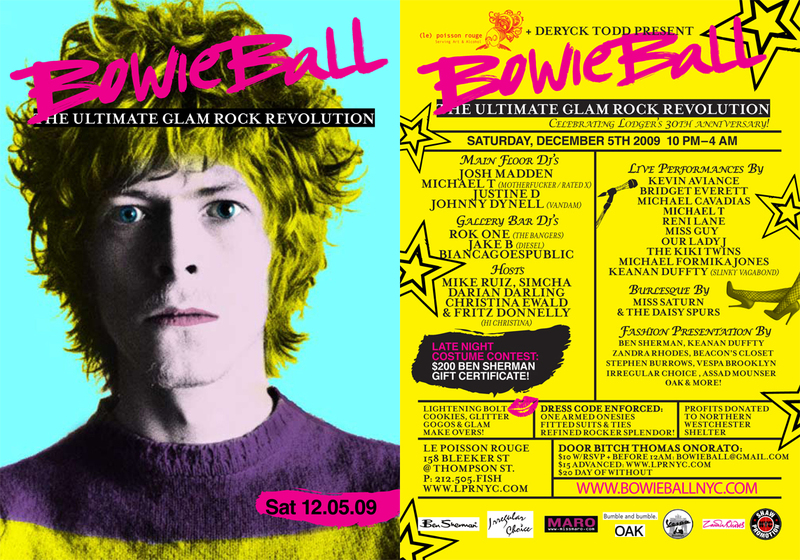 Get your tickets for BOWIE BALL tomorrow at Le Poisson Rouge! RSVP at BOWIEBALL@GMAIL.COM. Performances include Kevin Aviance and Bridget Everett while awesome DJ’s such as BIANCAGOESPUBLIC and JAKE D will be spinning in between sets! Oh! Did I mention that the costume contest will give away a $200 Ben Sherman gift certificate? Flier for this year's Bowie Ball! 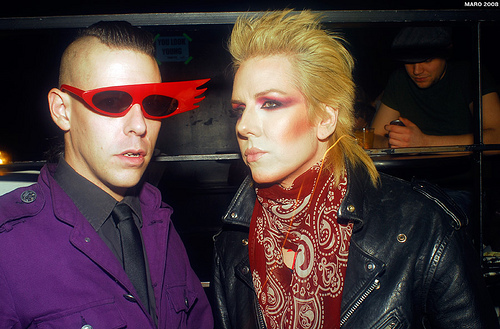 Bowie Ball 2008. Blondie anyone? Don’t feel like leaving Brooklyn this weekend? Well we don’t either! If you’re around Beorum Hill this Friday check out “Back in Da Days” at Deity Lounge! Deity Lounge on Atlantic in Brooklyn. “Back in Da Days” this Friday is featuring DJ Shark, DJ Sancon and DJ Suwa. There will also be a live performance by DobleFlo brought to us by the local Brooklyn Label! Party starts at 10 p.m. and goes to 4 a.m.
Deity is located on 368 Atlantic Avenue (Between Hoyt and Bond). “Dandy Lions” perform at Sidewalk Cafe! "Dandy Lions" performing their song "Owl and Frog" at Sidewalk Cafe last night. Lena's a customer here at "We the Free!" "Dandy Lions" performing last night at Sidewalk Cafe. You can't see it in the picture but Lena layered a great vintage dress with the LNA Mini she bought at "We the Free!" To listen to the Dandy Lions click here. “We the Free” loves these innovative, fun and iconic accessories done by up- and- coming designer “Anna Marcell” who’s based right here in BROOKLYN. Take a look at these beautiful rings made out of measuring tape! Marcell designs each one and makes it by hand… so every purchase keeps the economy local in Brooklyn and has its own special touch. And my personal favorite…. (because I always have to put that in)! Ford Foundation. Good architecture is never old news. Take a look at these photos taken by our MIT Cat for her “Photography Journalism” class. She did a story about the relections she found in the glass of the “Ford Foundation” building, a pioneer in architecture on 42nd Street. The Ford Foundation Building was designed by architect Roche- Dinkeloo in the 1950’s specifically for the organization. Reflection of the "Ford Foundation" building in its unfinished goldleaf lettering. Photo of he reflection in the window of the “ Ford Foundation” building, designed by Roche- Dinkeloo. Photo of he reflection in the window of the "Ford Foundation" building, designed by Roche- Dinkeloo.